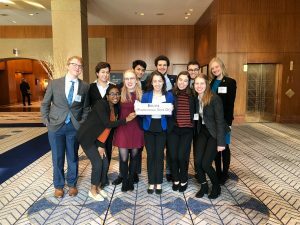 The delegation that attended the conference and represented the country of Bolivia consisted of 16 Wooster students, including Harris, Alena Carl ’19, Adam Gillmor ’19, Jordan Griffith ’19, Eric Guberman ’19, Vice President Nick Shiach ’20, Research Coordinator Annelisea Brand ’21, Alex Cohen ’21, Maureen Hanes ’21, Jillian Kouayara ’21, Olivia Proe ’21, Camryn Rosenstein ’21, Shankar Bhat ’22, Rory Helweg ’22, Andrew Lee ’22 and Emmy Todd ’22. Wooster’s team also took home awards for individual delegation performances. Griffith and Bhat won individual awards in the General Assembly Sixth Committee, and Guberman won an individual award in the United Nations Environmental Assembly. “Wooster’s success this year came from both a supremely strong group of first-time delegates and a strong foundation of our returning veteran members,” Harris acknowledged. However, Harris gives a lot of credit to the research team as well, stating, “Our research team is integral to our success, as they help write position papers and brainstorm strategy and policy priorities with the rest of our committee groups.” Wooster’s position papers also took home an award this year. Model UN will hold their first meeting for the spring season on Jan. 16, followed by tryouts that begin on Jan. 23.